It's been awhile since I VRS had started again. Had version 2.2 but apparently caused problems did not start. So I have installed the new version 2.4 and I sag behind "Data Source" silhouettes my folder with silhouettes. But I do not see any Silhouettes and flagging appear. I also check you sticky Operator Flags and Model Silhouettes on this forum but it didn't work. Let's try documenting this a bit better. The following is accurate as of December 2016. Recognize that linkrot and version changes in VR may make this useless. Scroll down to Operator Logo Starter Pack and download the "Bones" logo flag set. Unzip it into any folder you like... \VirtualRadar\Flags seems nice. Now, go to http://radarspotting.com/forum/index.ph ... n=register and register for an account. IN the VR server app, go to tools/options and point the flags and silhouettes pointers to the two folders you just populated and then exit out of VR and re-start it. You should now get operator logo flags and silhouettes in your VR list. Great... Now, what about the planes that don't have operator flags now? 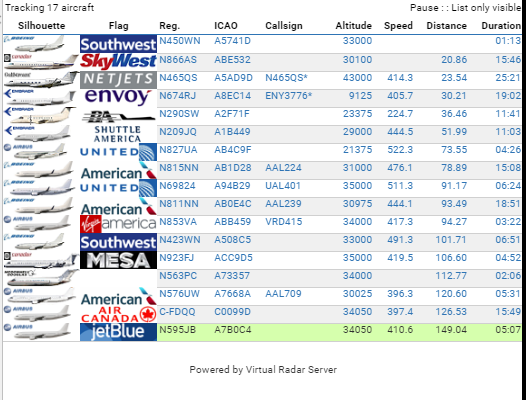 See my next post... how to tell VR to display corporate and military and other logos for planes where flags don't show up automatically... which will be coming up in a few days.